Would you like a sauna sausage? That’s what I was asked when I was visiting some friends in Finland last summer. I had no idea what a sauna sausage was at the time although logic told me it was a sausage cooked in a sauna. It turned out I was absolutely right! I was offered two different types of sausages, one had cheese in it and the alternate didn’t. Sauna sausages are called sauna Makkara in Finnish. I opted to try both. The sauna which my friends had was approximately a 3 hour drive north of Helsinki in the Finnish countryside at their summer cottage. The home sauna is located on a lakeside with picturesque views and not a car or any other man made noise to be heard. It was incredibly peaceful; quite an apt setting for my first sauna sausage experience! The sauna had been heating up for about an hour and the sausages were on a metal plate which was suspended above the sauna stove. They were thick long plump sausages which had cracked from the great heat from the sauna stove below. The heat from the sauna stove had made the skin of the sausages nice; it was perfect. I ventured up onto the top bench of the sauna and lay down. I glanced up at the temperature, it was about 80 Celsius. I put two ladles of water from the bucket (loyle) onto the sauna stove, feeling the heat quickly flooding the entire sauna. It felt wonderful. After 5 minutes I took a sauna sausage out of the sauna and sat on the decking wood looking out over the lake and pine forests. The sausage tasted fantastic and without a doubt the most special sausage I’ve ever had. I put the sausage down on the plate, swallowed my last bite and jumped in the lake; refreshing! I climbed back out, ate the rest of my sausage and entered the sauna again. It was a perfect evening if you ask me! Sausages just simply taste better in saunas! It’s that time of year again – Quite the challenge if you ask me, but one that these folks take on board with great dedication. The concept – Stay in the sauna the longest and you win. Seems pretty simple really, but when you realise the temperatures they’re playing with, this is no relaxing endeavour. This is an event that works up a great deal of sweat whilst competitors simply sit still. The 10th Annual Championship took place in Heinola, Finland, over the space of a weekend with 160 men and women from 23 countries pitting their wills against one another. It was to no surprise of the audience, to see the Finns dominate for the 10th year running. Finnish born Timo Kaukonen won the men’s only event by lasting in the sauna for 3 minutes and 46 seconds. The women’s title was taken by Russian born Tatyana Arkhipenko with an impressive 3 minutes and 9 seconds. Now you may be scoffing at those times, especially with my use of the word “impressive”. However, please take into account that the saunas they used were heated 110C with half of litre of water being poured onto the stones every 30 seconds! This makes it everything a relaxing sauna isn’t, which is normally heated to around 70-80c. One man and his sauna. Former President of the Philippines, Mr Joseph Estrada has revealed that the secret to his trouble free health has been due to his daily use of a sauna. Estrada claims that he doesn’t believe in skin care products, health supplements, surgery that defies ageing or sunblock. He states that his sauna health regime quite simply involves a 30 minute sauna session every single day, which he has kept strict to over the last 50 years. “I don’t take vitamins, I just make sure I have my sauna once a day for 30 minutes. I’ve been doing it for 50 years and it’s the reason I don’t get sick,” said Estrada, at a television interview for THE STAR who at 72 claims that he in perfect health. After having a complete executive health check at the Cardinal Santos Hospital in San Juan City, Estrada requested that the results of the check-up be made public. “The figures speak for themselves. You see, I’m pretty healthy” he declared with confidence. Besides from having recovered from osteoarthritis just over four years ago, where he underwent knee replacement surgery, Estrada’s records show just how well he has kept himself. An individual instance such as this one is yet another testament to how remarkable using a sauna regularly can actually be for your health. With many different sauna options now easily accessible to the general public it seems that you can’t deny yourself this life luxury any longer. A chocolate sauna? This doesn’t make any sense if you’re thinking about a sauna that is made out of chocolate as many people do. When I first heard about chocolate saunas I envisioned a sauna made out of chocolate, full of an intoxicating chocolate aroma, with the inner walls melting slowly, caving in as the heat softened the delicious structure. In a perfect world a chocolate lover would have all saunas made out of chocolate, but you’ll just have to settle for second best: Covering your body in chocolate. That’s right, sauna enthusiasts and novices alike have been experiencing the wonderful delight of covering their bodies in chocolate, and entering in and sitting back in a hot traditional sauna. The heat of the sauna starts to melt the chocolate which is coated on the body, which slowly drips off. Simultaneously, the body sweats as it’s heated, allowing the invigorating benefits of the chocolate to penetrate the pores. The Atlantis water park, which has 16 pools, slides, wave machines, underground caves, whirlpool, geysers, relaxation areas and 15 saunas say that the chocolate contains no sugar, is 70% cocoa and is full of nutrients which will make the body feel wonderful. The experience of a chocolate sauna would certainly be a memory that would stay with you forever, if not for it’s invigorating rush, then for its unique novelty. So where can you find one? Chocolate saunas can be found at the Atlantis, which is in Ljubljana, the capital of Slovenia. The chocolate sauna isn’t the only appeal of Ljubljana, which offers an array of wonderful sights and attractions, including a festive Christmas market in December. If you like mud masks, body scrubs and luxurious spa treatments, maybe you should add this to your ‘To try’ list. What are you waiting for? Cosy Spa Haven at Home! I think you’ll agree that the bathroom is one of the places you can truly escape the stress of everyday life, and with multiple options becoming widely available and affordable it may be easier than you think to achieve true rest and relaxation. The bathroom is one room in the house that tends to have a lock on the door, and allows you to keep the outside world at arms length. The most luxurious hotels and day spa retreats provide us with endless inspiration from beautiful whirlpool baths, real wood saunas and steam rooms geared to promote a true feeling of relaxation and well being. However, when it comes to deciding on your own home spa it is important to consider what you prefer the sensation of first. Do you prefer the relaxation provided by swirling water from body massage jets and bubbles or do you prefer to sweat it out in a sauna? Be sure to allocate your space as simply and effectively as possible. Layouts that are warm, clutter-free and enclosed are best suited for true mind and body restoration rather than an open plan environment. So rather than spending your budget on knocking down structural walls and creating too much work, concentrate on a designated area and start creating your own cosy spa haven. 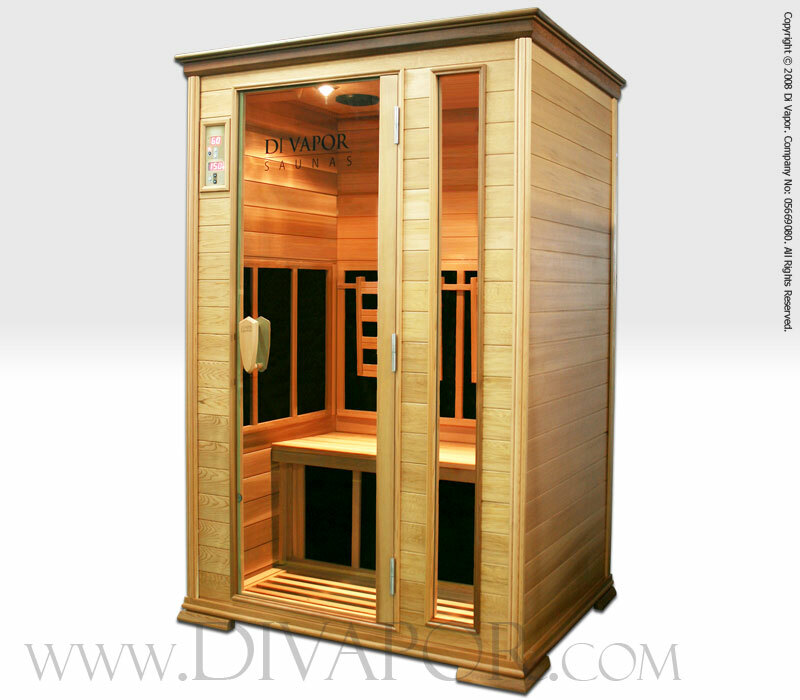 Log onto www.divapor.com to the full range of steam rooms, hydromassage whirlpool baths, and infrared saunas. With sizes and designs to suit all, you simply won’t be disappointed. Kate Moss snaps up Sauna! Supermodel and singer, Kate Moss, has recently had an infrared sauna installed in her North London home reports suggest. Typically, singers and performing artists are encouraged to not use conventional saunas as there is danger of drying out the vocal chords. As we know, an infrared sauna operates at a lower environment temperature, so sitting inside the cabin is a relaxing “easy-breathe” experience that isn’t stressful on the body. A conventional sauna can sometimes prove to be a little too intense for some, making the infrared sauna the next best thing. Moss has taken delivery of a “samarium”, which is a sauna that takes advantage of aromatherapy oils – her body will thank her for it!